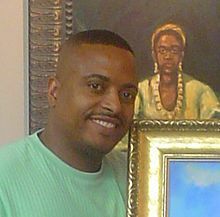 Ellis' involvement in the community as an art advocate and educator has earned him recognition from numerous organizations and city officials. Ellis' latest exhibit entitled, "Capturing Our Culture And Heritage" encompasses the diversity and cultural similarities of all Americans. This exhibit will travel across the country, visiting Chicago, New York, Mississippi, and New Orleans, in the next few months. Some of Ellis' previous national exhibits include: "The Civil Rights Movement", "Buffalo Soldiers", and "Born In The Spirit". Ellis, who currently resides in Friendswood, Texas, has been recognized as one of the most celebrated artists of the 21st century. In a mere ten years, T. Ellis Art, Inc. has sold over 1,500,000 prints and posters nationwide. Ellis' private collectors are many and scattered throughout the globe. Major corporations have commissioned Ellis; A few of which include: Walt Disney Studios, The Minute Maid Company, Coca-Cola, Phillip Morris, and Avon, Incorporated. "Unite A Man With Conviction And Something Powerful Happens."